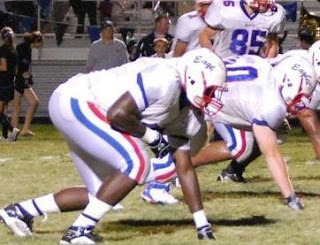 Finley, the lone junior starter on Olathe North's offensive line last season, helped the Eagles rush for over 4,000 yards in 2010. Olathe North will be counting on Finley to step up and lead what will be a relatively new offensive line unit. Luckily for the Eagles, Finley gained tremendous experience last season playing on one of the better offensive line units the school had fielded in years. Finley has a great size and is more athletic than most of the lineman he will be facing during the year. It also helps that Finley will be blocking for Victor Simmons and Adonis Saunders, two of the better runners in the league who will won't hesitate hitting the holes the offensive line opens up for them. Kyle Swartz will back as well at the tight end position which will give the Eagles another retuning starter with great experience in the run blocking game. Finley may also play an increased role on the defensive side of the ball, trying to make up for the loss of All-Decade defensive tackle Lucas Vincent.